At the end of the second day of the second Ashes test, it was all English who had dominated the Aussies completely. Yesterday Anderson, and today Cook was the part of the scheme to make Australians look completely miserable. 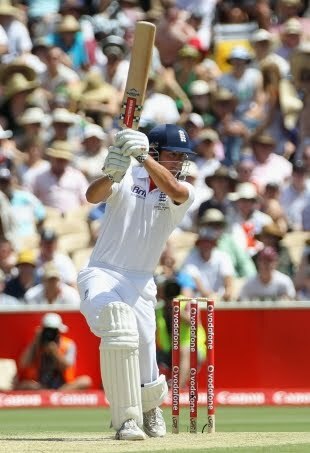 At stumps Alastair Cook was still on the crease with Pietersen aat 317-2. Though Aussies were able to get the wicket of captain Strauss at 1 by Bollinger while England had just three runs on the board. After that there was no looking back, passion was the only weapon they could offer on a pitch as flat and true as anything that England have encountered in 12 months.Cook and Trott were ready to punish the Aussies. Brutal, merciless, uncompromising accumulation was the upshot. Trott lifted his average up past 60, and briefly became No.2 to Bradman in terms of batsmen who've made more than 1000 Test runs, but even his formidable powers of concentration have been put in the shade by his colleague.They did not less than killing Aussie's morale kept on building partnership till Trott was removed by Harris on 78. Cook during his fine innings had a bit of scare when there was caught behind appeal on the bowling of Siddle which was given out by the umpire but later Cook reffered for UDRS which worked in his favour. Last week at the Gabba, Cook surpassed one of Don Bradman's innumerable records when he posted 235 not out, the highest Test score by any batsman at the ground. Today he drew level with the Don on another front, by racking up his 15th Test century before the age of 26, a tally that only Sachin Tendulkar (with 19) has surpassed. His back-to-back Ashes hundreds mean he's emulated Ken Barrington in 1965, while his tally of 371 runs without dismissal surpasses Wally Hammond. Now what Australia would come miraculous comeback in order to challenge the never stopping English players. Let's see what happens on the third day, what ever it would be it would not be less than an action packed thriller.